Throughout the four-year history of the All-America Football Conference, the Cleveland Browns were the dominant club while the San Francisco 49ers had been just as consistently second best. The teams were Western Division rivals for the first three years, but as the teams faced off on October 30, 1949, they were part of a division-less AAFC, the league having dropped to seven clubs for its fourth (and final) season. The teams had met three weeks earlier in San Francisco, where the 49ers humiliated the Browns by a score of 56-28. The result briefly put San Francisco ahead in the standings, but the 49ers, who had thus far played one more game than Cleveland, lost to the Yankees the week prior to the rematch and were thus 6-2. They also lost two stalwarts of their running game, halfbacks Johnny Strzykalski and Ed Carr, to injuries. The Browns, having thrashed the Los Angeles Dons before their bye week, were on top at 5-1-1. While the top four teams in the league were guaranteed playoff spots – and there was no doubt that the Browns and 49ers would be two of those teams – the game was clearly a grudge battle between the league’s two premier franchises. It was also billed as a showdown between the two quarterbacks who had been co-MVPs of the AAFC in 1948, Otto Graham of the Browns (pictured above) and San Francisco’s Frankie Albert. Games between the Browns and 49ers typically drew big crowds, and there were 72,189 in attendance at Cleveland’s Municipal Stadium. They saw a scoreless first quarter as both offenses were slow to get on track, although a one-yard scoring plunge by Cleveland’s Graham was nullified by a penalty. On the first play of the second quarter, the deadlock was broken when Frankie Albert of the 49ers threw to HB Len Eshmont, who went 48 yards for a touchdown, thus finishing off an 88-yard drive. Joe Vetrano added the extra point. The Browns came back quickly. HB Dub Jones returned the kickoff 66 yards to the San Francisco 28. Otto Graham threw to end Mac Speedie for 16 yards and then to end Dante Lavelli for a nine-yard TD. Lou Groza’s PAT tied the score at 7-7. The 49ers responded in kind as, taking over at their 30 following the kickoff, Albert went long for HB Sam Cathcart, who gained 62 yards. HB Verl Lillywhite ran the last eight yards for a touchdown and, with Vetrano’s extra point, San Francisco was up by 14-7. Three TDs had been scored in a space of less than three minutes. Before the first half was over, the Browns mounted another scoring drive. Graham threw to Speedie and Lavelli to bring the team down the field and Jones ran for a six-yard touchdown. The score at halftime was 14-14. Early in the third quarter, Graham carried directly over center for 20 yards and a TD to put the Browns in the lead for the first time. Heading into the fourth quarter, the Niners tied the game back up when Albert completed two passes to end Alyn Beals that covered 35 yards, including 22 yards for a touchdown. The extra points were successful and the score was 21-21. Midway through the final period, Lou Groza kicked a 38-yard field goal to break the deadlock. It followed a Graham pass to Lavelli for 30 yards to the San Francisco 32. The Browns then padded their lead with a Graham-to-Speedie touchdown pass that covered 12 yards. However, the extra point attempt failed when the snap from center was high and Groza, grabbing the ball at shoulder level and unable to kick, ran and was pushed out of bounds at the one. Nevertheless, Cleveland was up by nine points. Time finally ran out on the visitors. The 49ers scored one last touchdown on a quarterback sneak by Albert, but there were only 15 seconds left at that point and the Browns won by a final score of 30-28. The 49ers had the edge in total yards (477 to 400) and first downs (19 to 17). The passing statistics of the two quarterbacks were similar as Otto Graham completed 14 of 25 passes for 271 yards and two touchdowns with none intercepted while Frankie Albert was successful on 14 of 27 throws for 253 yards, also including two touchdowns with no interceptions. 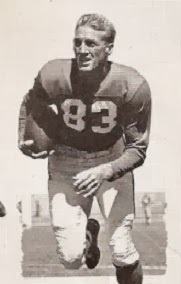 San Francisco’s Joe Perry was held in check, but rookie Sam Cathcart (pictured below) ran effectively for the 49ers, gaining 116 yards on just 11 carries. The win for the Browns effectively decided the race for first in the AAFC. They didn’t lose again the rest of the way (including another tie) and finished at 9-1-2. San Francisco also didn’t lose again on the way to a 9-3 record and second place. The teams met one last time for the league championship, and the Browns won. 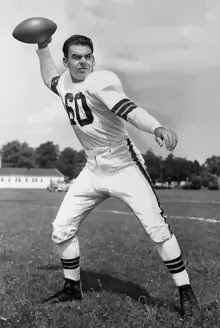 Otto Graham led the AAFC in pass completions (161), yards (2785), and yards per attempt (9.8) while Frankie Albert topped the league in TD passes (27). Joe Perry was the top rusher (783 yards) and Mac Speedie the top pass receiver (62 catches, 1028 yards). Alyn Beals led in touchdowns (12) and scoring (73 points). Over the course of four seasons, the Browns went 47-4-3 and won all four league titles. Two of their losses came at the hands of the 49ers, who were 38-14-2. While the league folded following the ’49 season, both franchises moved into the NFL for 1950 and have remained there, although they were never again in the same division and the intensity of the great AAFC rivalry diminished.